1987/88 ish with a dual line Skynasaur...long lost. Anything interesting. For those curious about the nickname, it refers to a geological formation. Was asked if I was a professional flyer. Gues I've made it to the intermediate level? Back in Oct. at the Enid convention, I won a stack of 24ish Skyfox. They vary in condition, but I was able to get 12 strung together. Now I need to figure out how to connect it to lines. This is my first stack so I'm very new to this. Can I get some help with control bar parameters? And maybe a pic of the bar? I don't think there is a control bar in the bag but I'll look this evening. And, in a 10-15mph wind how strong a pull can I expect? They are small about 24" wing span. Thanks any help/advice would be appreciated. Monte I posted this at the end of a thread on the GWTW site, http://www.gwtwforum.com/index.php?topic=9638.msg87133#msg87133 and wondered what you guys had to add? 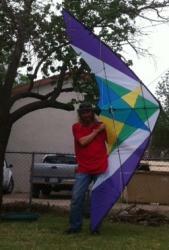 Getting ready to head out for the 8th Annual Perrin, Tx Kite Festival. http://www.azcentral.com/thingstodo/events/articles/20130313kite-flying-festival-fountain-hills-basant.html Kite Flying Festival When: 11 a.m.-6 p.m. Saturday, March 23. Where: Fountain Park, 12925 N. Saguaro Blvd., Fountain Hills Arizona. Admission: Free. Details: 623-572-9526, pakistaninformation.org. Had a really good time in Enid. Got to meet a bunch of new friends...still grinning. Just stopped in to say hey...HEY.